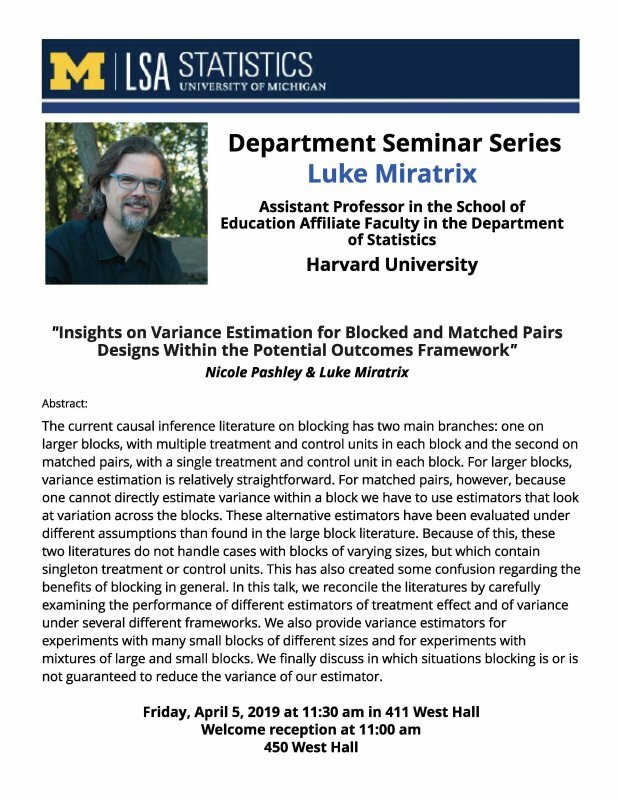 "Insights on Variance Estimation for Blocked and Matched Pairs Designs Within the Potential Outcomes Framework"
The current causal inference literature on blocking has two main branches: one on larger blocks, with multiple treatment and control units in each block and the second on matched pairs, with a single treatment and control unit in each block. For larger blocks, variance estimation is relatively straightforward. For matched pairs, however, because one cannot directly estimate variance within a block we have to use estimators that look at variation across the blocks. These alternative estimators have been evaluated under different assumptions than found in the large block literature. Because of this, these two literatures do not handle cases with blocks of varying sizes, but which contain singleton treatment or control units. This has also created some confusion regarding the benefits of blocking in general. 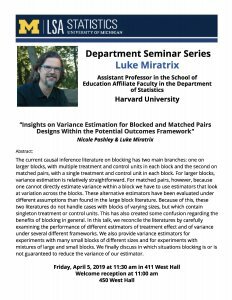 In this talk, we reconcile the literatures by carefully examining the performance of different estimators of treatment effect and of variance under several different frameworks. We also provide variance estimators for experiments with many small blocks of different sizes and for experiments with mixtures of large and small blocks. We finally discuss in which situations blocking is or is not guaranteed to reduce the variance of our estimator.